Adam Chase is the pseudonym of author Eve Seymour who was ‘outed’ (by choice) at the Cheltenham Literary Festival. Here, in an exclusive article for bookoxygen she explains why sometimes it’s hard to be a woman. Whenever I pick up a phone to obtain information about guns, motorbikes, helicopters, police procedure, forensics, basic politics of how certain organizations work, I often, although not exclusively, find myself conversing with a man. This has always played in my favour because, for whatever reason, men really like the idea of a woman being interested in what they consider to be traditionally masculine pursuits. Not once have I been told to sling my hook because ‘you can’t possibly understand; you’re a woman’. Perhaps it’s also because we have women reporting on issues of defence and embedded female journalists travelling with armed forces into war zones. However, occasionally I’ve come up against a disconnect between reality and what readers find acceptable when it comes to writing fiction. I once participated in a panel where I was criticized for what was deemed excessive violence in a torture scene. The complaint came from another woman and the general thrust was: ‘You’re a woman so how can you, of all people, write this stuff?’ As I tried to explain the dramatic argument and point of the scene, which cut little ice, I got the distinct impression that my gender should make me more moral and less aggressive than my male counterparts. Moreover, I felt as if I’d transgressed the ‘sisterhood’. On another occasion, I was asked, this time by a male radio presenter, whether I had a pint in one hand and a fag in the other, to ‘get myself into my male characters’. It made me laugh out loud because I thought it a bit of an own goal – no pun intended: not all guys swill beer and chug away on full-strength cigarettes, or, indeed, play football. When I explained I actually find it easier to crawl inside a male psyche and write from a male perspective, I was greeted with bewilderment. At a breakfast club meeting, I once gave a fifteen minute talk on what it’s like to be a thriller writer, in other words a quick rundown of all the glamorous aspects rather than the hard nuts and bolts of sitting down and constructing and writing a great story. The assembled consisted of around forty businessmen from every field of law, commerce and industry. The talk went down extremely well. At the end I asked for a show of hands for those who read action and adventure/crime thrillers. Every hand shot up. When I requested a show of hands for those who would willingly pick up and read a thriller that they knew to have been written by a woman, not one hand was raised. Gallantly, they told me that I didn’t count because I was different, presumably because I’d won them over with my chat. So, is there a male/female divide among readers? Crime fiction fans are savvy and sophisticated. When it comes to police procedure and forensics, they are often more knowledgeable than the average writer and can spot credibility issues at fifty paces. Most will be on the lookout for the killer before they have flicked through the first page. Violence presents little problem to the majority and, from talking to readers, I don’t discern a gender split. As a writer, if you want to impress and woo, find some obscure forensic detail or unusual method of dispatch. Make no mistake, if you don’t grab attention, the average crime fiction reader, male or female, will simply move onto the next novel because there are so many classy writers from whom to choose. So what is really going on? Cutting to the chase, I think it comes down to sub-genre. While there is a long tradition of female writers who have male detectives as main protagonists, how many female writers have male action adventure heroes as the main lead, or even morally ambiguous characters like Hex, the assassin in my latest novel, Wicked Game? Crime writer Martin Edwards, author of The Frozen Shroud, touched on this in an article, and I think this is where an element of complexity creeps in. Rightly or wrongly, there is a perception that women cannot write as convincingly and authentically as men about guns, weapons, biological, or otherwise, explosions, flying off in helicopters, tearing off on motorbikes and security service issues. Off the top of my head, I can think of a couple of female writers who do just that extremely well: Meg Gardiner and Zoe Sharp, and apologies to those not included. However, to write this type of blood and guts, all action thriller with a male protagonist and write it with a first person narrative definitely pushes certain ‘you can’t do that’ buttons. Add on a male protagonist who is, essentially, a bad guy (even if he does screech to a halt in the opening scene and question his morality) you then enter the ‘we’ll never sell you as a woman’ arena. Hence, I reckoned that if I couldn’t beat my male counterparts, I’d join them, which explains why I chose a male pseudonym. 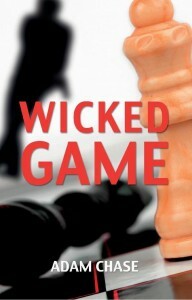 When five people at my publisher read Wicked Game, nobody rumbled me. Once an interest was declared, my agent had the job of ‘fessing up’. The first response was blank amazement, the next a smile. They got it. They got the work and they got me. That’s all you can ask for as a writer. My cover was blown the moment I participated on a panel at 2013 Cheltenham Literary Festival. So was my subterfuge a waste of time? I don’t think so because, by adopting a male pseudonym, I’m setting out my stall, conditioning the reader to expect a certain type of male action dominated novel. Readers can then make an open and honest choice, to move on, or to pick it up and, hopefully, enjoy.